Jon Kern enjoys working with teams to solve challenging development projects for the stakeholders. From analyzing the approach, to helping provide solutions, mentoring teams, and all points in between, Jon routinely has significant impact on the projects he works on. Often with a team of experts from his friends at Immuexa and CreteSoft, the small teams of 3-6+ people supply a quick-hit ability to solve problems and deliver results. Projects routinely see high quality solutions in half the time, and leave the local team in a better place: mentored on OO and agile, and excited. 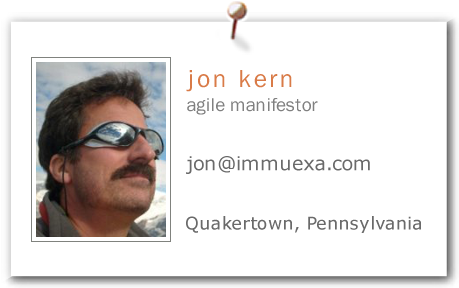 Jon worked with Kent Beck, Martin Fowler, Alistair Cockburn, Ron Jeffries, Ken Schwaber, Ward Cunningham, and others to co-author The Agile Manifesto For Software Development. He also co-authored Java Design with his long-time mentor, Peter Coad, and worked on a few other books where he published his lightweight development processes. Jon is a bit of a process freak, but pragmatically so. After 5 years with jet engine R&D; 9 years DoD consulting, doing real-time man-in-the-loop flight simulation; and 4 years running his own successful software company, serving clients like IBM and Ingersoll-Dresser Pump. In late 1999, he joined Peter Coad as one of the original execs who started TogetherSoft. While there, he built the mentoring team (services), he drove design and development of a second product line, and he was a major contributor to ControlCenter's design and development success from 1994 up through the sale of TogetherSoft to Borland in 2003. Jon's experience is wide-ranging across varied problem domains and technology platforms. He has led numerous teams, consulted with hundreds others, and led TogetherSoft's development teams (commuting to St. Petersburg, Russia, for two years). Jon was recruited by Compuware's OptimalJ product team in May 2003. For the next 3.5 years, Jon tried to influence product direction and sales strategies; and he worked with clients to kick-start their projects. In August 2005, Jon started a blog and a newsletter for Compuware. A year later, his blog received 34K views and he had over 6700 subscribers to his opt-in newsletter. Jon has seen a lot, done a lot, built companies, and has helped hundreds of teams be successful. His unique blend of engineering skills, rapid assessment of situations, attention to cultural issues, and leadership by example, have served to make him a valuable asset on many projects.